For first time ever, Israelis see differences between right and left as being greater conflict in society than division between Arabs, Jews. For the first time, Israelis said the main point of conflict in their society is between left and right and not between Jews and Arabs. 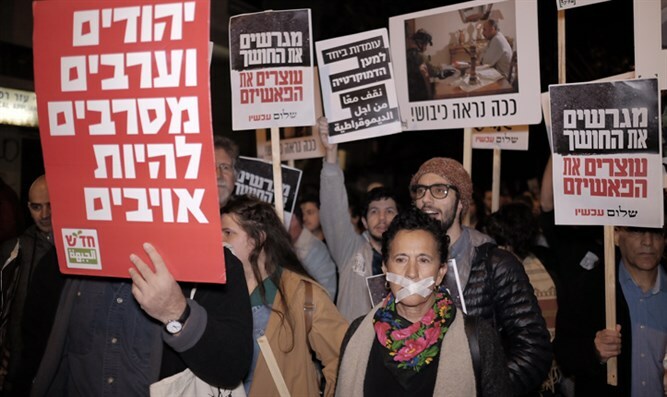 In the survey of 1,041 Jewish and Arab respondents, some 36 percent held the view that tension between the left and right is the main point of contention in society, with 28 percent saying it is the conflict between Jews and Arabs. Twenty-four percent said the main conflict is between religious and secular Jews. The last time the question was asked, in 2016, 29 percent perceived the left-right struggle was the main point of contention and 48.5 percent saw it as Jews and Arabs. In 2012, it was 9 percent and 47 percent. Some 45.5 percent of Israeli Jews and Arabs believe the democracy is in peril, mirroring the figures from last year’s survey. Among Arab Israelis in the newest survey, the figure is 70 percent; among secular Jews, 57 percent; and national religious Jews, 13 percent. * The most trusted state institution is the army, at 89 percent, followed by the president at 68 percent. Slightly more than half of Israelis trusted the police. * 81.5 percent of respondents are proud to be Israelis. That breaks down with 88 percent of Jews and 51 percent of Arabs, down several points from the previous year. * 79 percent of Israelis feel they have little or no influence on government policy and 56 percent do not agree that most Knesset members work hard and are doing a good job.